Ngoc Lan - Voice of an Angel: Did You Know That Ngoc Lan Could Also Sing in Chinese? Did You Know That Ngoc Lan Could Also Sing in Chinese? When we think of Ngoc Lan and the several different languages that she could sing in other than Vietnamese, the first language that would come to mind would naturally be French with all of the beautiful French love songs she had recorded throughout her career. We all loved Ngoc Lan's covers of French love songs not just because her pronunciation in French was rather good, but more so because of how she was able to put her heart and soul into the music with each recording. She could easily just break your heart with her somber, yet sweet voice that just seemed perfect for such easy listening, romantic French ballads with the most beautifully written sad lyrics. I still get goose bumps everytime I listen to Ngoc Lan's rendition of Je Pense Encore à Lui that was featured on her first solo studio album. That was probably one of the most heartfelt performances I've ever heard. Of course, there are countless others such as Vivre Pour Toi, Mourir Pour Toi, Viens M'embrasser, Ne Laisses Pas Ma Vie Sans Toi, and pretty much any of the rest of the songs she had recorded on her third solo studio album, L'amour Tinh Ta. The songs she had selected along with her deliveries on that album were nothing short of perfection. I could go on and on about Ngoc Lan and the long list of French songs she had recorded which I loved so much. But this article is about another language that Ngoc Lan was able to sing in other than Vietnamese. I'm not talking about English. We all know our beloved Ngoc Lan had made many efforts to sing in English during her career, and although her English was pretty good as she was able to speak, read and write in English pretty well, when she sang in English, she just couldn't get beyond her thick Vietnamese accent. That was rather odd, when I think about it, because when she spoke in English, she barely had any accent at all. The language that Ngoc Lan was able to sing in that I find to be rather shocking was Chinese. 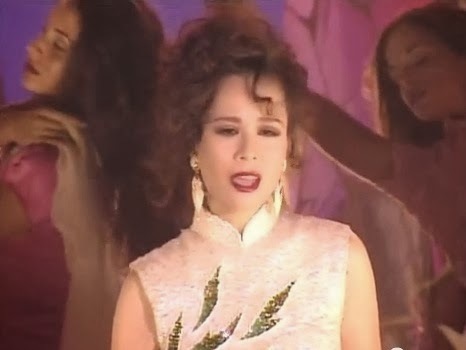 When we think of Vietnamese singers that were able to sing in Chinese, singers like Kim Anh, Tuan Dat, Lucia Kim Chi and Thai Doanh Doanh pop up in our minds. Afterall, these singers are of Chinese descent and are able to speak Chinese. But not Ngoc Lan. During the era sometime in the 1980s, Chinese dramas had become so popular with Vietnamese people, as a matter of fact throughout all of Asia, this period became known as the Chinese Wave. The Korean Wave is now in effect with the popularity of Korean dramas. Haven't you noticed how a lot of Vietnamese are now listening to Korean music? Well, during the Chinese Wave, many Vietnamese singers jumped on the band wagon and started to sing in Chinese. Among them were Elvis Phuong, Kieu Nga, Hai Ly, Julie Quang, billed simply as Julie, and even our own beloved Ngoc Lan. I've found three songs that Ngoc Lan had recorded in Chinese. The first was a song featured on Asia Productions' third volume cassette, Da Vu Xanh. The name of the song in Vietnamese was Cung La Buon. I wasn't too crazy about the song. But I did, however, like Ngoc Lan's vocals on it. I found it a bit surprising to hear Ngoc Lan sing in Chinese the first time I heard it. The other two were released by Da Lan. One of them was a song she had recorded on a compilation album entitled as Co Gai Do Long, which consisted of 12 popular Chinese love songs recorded by various Vietnamese artists such as Tuan Anh, Huong Lan, Kieu Nga, Luu Hong, Nhu Mai, Tuan Dat, Duy Quang, Hai Ly and Bich Ha. The Vietnamese title for the song Ngoc Lan had recorded on this album was Dong Song Ly Biet 2. I especially loved this song. Ngoc Lan did an excellent job with this recording. I don't speak any Chinese, myself, to know whether her pronunciation was good or not. But the other day, one of my good friends, Richard, who is Chinese was listening to it. He smiled a bit. When I asked him what he thought of her pronunciation, he just said he thought it was very cute. By the way, there is one other track on Co Gai Do Long that is worth mentioning. Singer Luu Hong had recorded a track featured on this album entitled as Lau Dai Tinh Ai which really took my breath away the first time I listened to it. I still get goose bumps whenever I listen to Luu Hong's outstanding performance with this song. I'd say out of all the tracks featured on Co Gai Do Long, the two tracks recorded by Luu Hong and Ngoc Lan really made the entire album. The last out of the three songs that Ngoc Lan had recorded partially in Chinese was featured on Da Lan Volume 22: Nhac Phim Bo Chon Loc. Like the previously mentioned compilation album released under the Da Lan label, this album would also consist of 12 tracks, all of which were covers of popular Chinese love songs. Ngoc Lan had recorded two tracks on this album; a duet track with Vu Khanh, Tron Kiep Yeu Nguoi, and a solo track, Cuoc Doi Phu Du, in which she had recorded about half of the song in Mandarin. I neither cared much for her delivery of this song, the melody of the song nor the Vietnamese lyrics that had been written for Ngoc Lan to record. As a matter of fact, this entire album was rather disappointing. Despite the impressive lineup of various artists featured on this compilation album which included Vu Khanh, Ngoc Lan, Kieu Nga, Duy Quang, Nhu Mai, Mai Huong, Thanh Phong, Luu Hong, Hai Ly, Thanh Mai, Tuan Vu, Kim Tuyen, Tuan Anh and Bich Ha, the entire production just seemed like a sham. I tried my best to listen to the entire album from beginning to end, and I couldn't even come up with the slightest compliment for anything. Not the sound quality, photo cover, vocals, arrangements, song selections were even of mentioning. Overall, the quality level of production for this album was poor. If it were to be given a grade, I would give it a C minus only because I'm rather generous. It should really get a D grade. What Exactly Is Multiple Sclerosis?